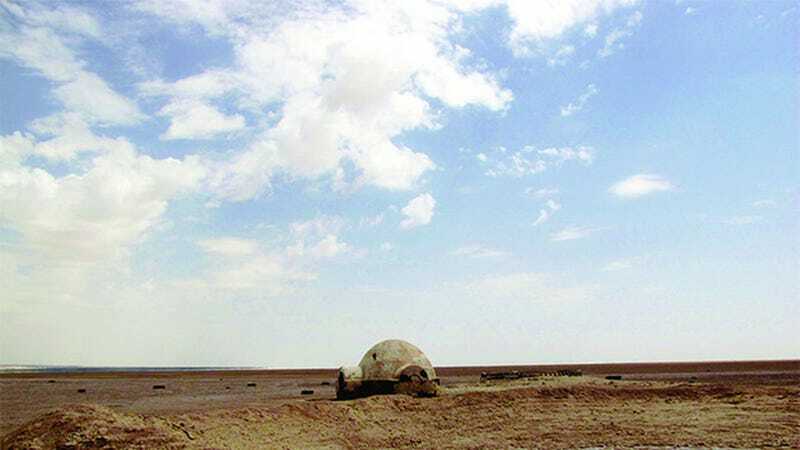 While there are some attempts at preserving them for future generations, the fact is most of the sets used in the Tunisian desert for the Star Wars films - either the classic or prequel trilogy - have fallen into disrepair. Something that New York photographer Rä di Martino has captured beautifully in these photos taken of what remains of what we know as Tatooine. Amazingly, while the sand has reclaimed many, there are still buildings and in Mos Espa's case even entire "towns" still standing. While most of these husks appear to be from the more recent films, she hit paydirt with one find, getting locals to take her to what's left of Luke Skywalker's original home from 1977's A New Hope. It's just a buckled metal frame, but still. If there was ever going to a sacred place on God's own Earth for Star Wars fans, this must surely be it.